‘Littletopia’ curated by Red Truck Gallery is a carefully chosen collective of innovative galleries who are breaking down barriers, bucking convention and letting their skilled artists create a new vocabulary. With a focus on craftsmanship, accessibility, and artistry, Littletopia embraces the adventurous collector and draws them into a place where the fantastic become reality on canvas, mixed media, sculpture and print. A place where the art curious can appreciate beautifully rendered pieces and be welcomed into a family of galleries who evoke a mood, from playful, provocative, intriguing, and shocking to downright scary. The driving force behind Littletopia, Red Truck Gallery, founded by Noah Antieau, is the antithesis of white washed minimalism. Beneath its colorful and inviting veneer, this New Orleans gallery has a subversive soul, presenting eclectic works that combine a wicked sense of humor and an unflinching eye for detail. Littletopia is similarly and intentionally eclectic. Defying categorization, the participating galleries share a respect for artistic craft and a mission to bring a fresh new attitude to a cynical art establishment. 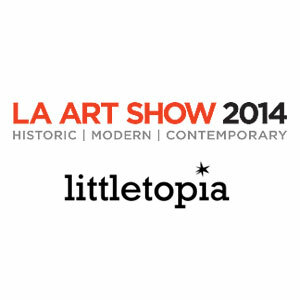 Littletopia Curated by Red Truck Gallery will be at The LA Art Show from January 15 – 19, 2014 concurrently with the Los Angeles Jewelry & Antique Show at the Los Angeles Convention Center, South Hall 1201 Figueroa Street, Los Angeles, CA 90015. For additional information about the Los Angeles Art Show, to register for lectures & book-signings or purchase online tickets, please visit www.laartshow.com. For 19 years The LA Art Show has delivered the broadest spectrum of art from across the globe to Los Angeles’ diverse and engaged collector base. The Los Angeles Art Show, created by KR Martindale Show Management and FADA, is the longest running venue for contemporary, modern, historic and traditional art in the country.